Herbig-Haro object caused by the young variable star V633 Cas. Visible is the surrounding dust envelope. The southeastern extension on the DSS image is HH161. IC349 is a very small, interstellar dust cloud, which passes the bright star Merope deforming the nebula. Visually very challenging due to the short angular distance. Unfortunately the nebula isn't visible on the alongside DSS image. 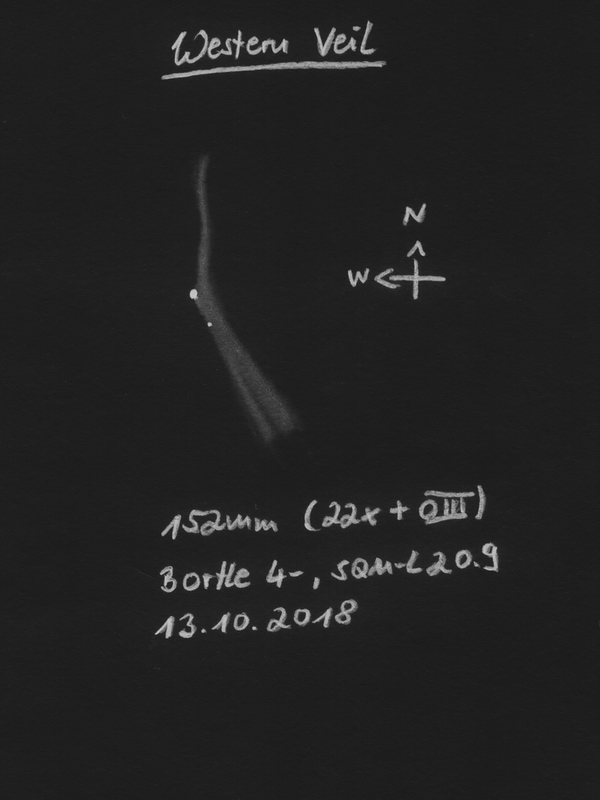 SQM-L 20.8: Comparable with the observation in the 12.5 inch Dobsonian, just a bit fainter. At 37x with [OIII] filter the nebula was quite faint with averted vision. IC1318 describes a large HII region around gamma Cyg (Sadr). The alongside DSS image shows only the Butterfly Nebula, which is one of the brightest parts located to the east of gamma Cyg. The name Butterfly Nebula is also used for a planetary nebula in the constellation Ophiuchus (Oph) with the designation M2-9 (PK10+18.2). Relatively small, roundish, evenly bright. Fairly well seen with averted vision. Well visible with averted vision, but not conspicuous. Slightly oval, evenly bright, rather faint. Rather faint, slightly oval, evenly bright. Barely visible with direct vision, evident with averted vision, rather small, oval, evenly bright. Obvious as slightly oval, evenly bright nebula. Evident brightening with an embedded, slightly curved chain of 4 stars. Evident, slightly elongated, evenly bright. Emission nebula within the galaxy Messier 33. Brightest emission nebula within the galaxy Messier 33. 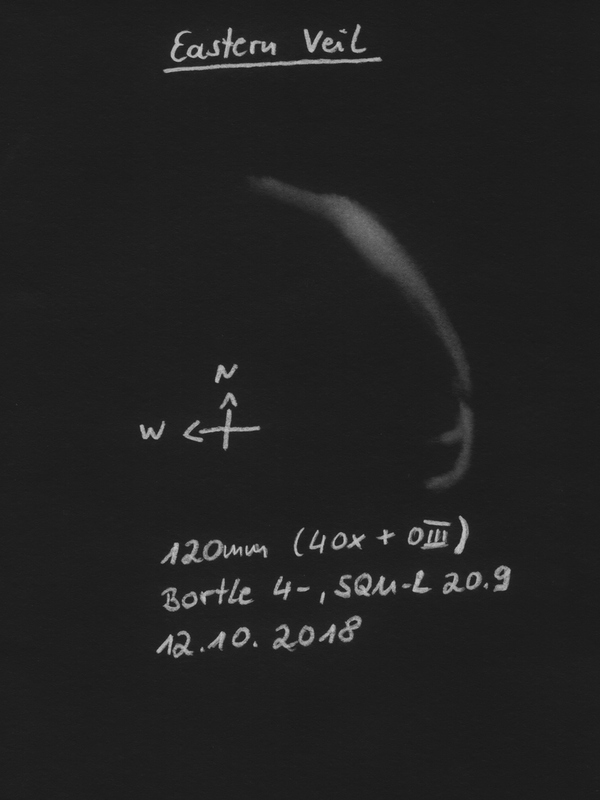 At 34x rather faint, very compact. At 72x still small, round, slightly condensed, conspicuous with averted vision. 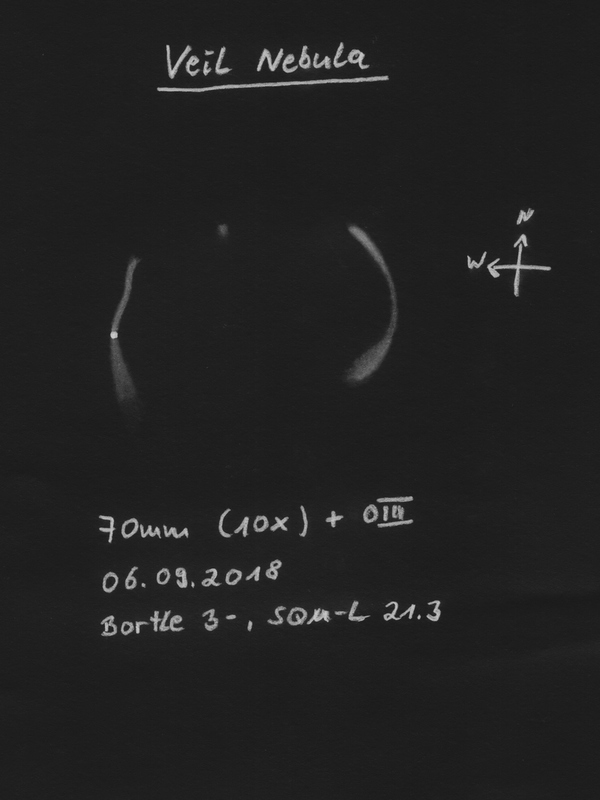 With HBeta filter very conspicuous with averted vision, large, slightly curved with irregular shape. To some extent I could see differences in brightness within the nebula. With UHC filter the nebula appeared pretty faint without any details and was only visible with averted vision. Without any filter the nebula was not visible. Barely visible with direct vision, with averted vision obvious. 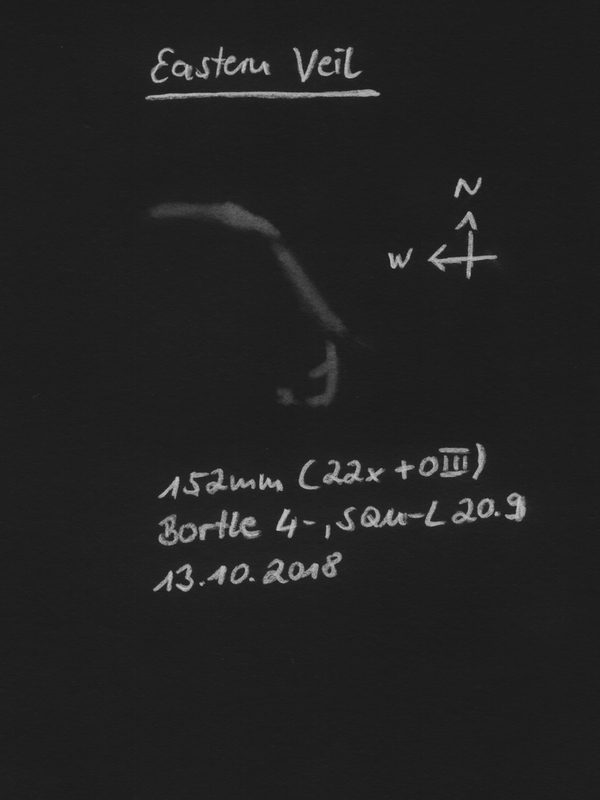 Very large, elongated, slightly curved brightening, which could be followed over the entire field of view of about 2.4° due to the usage of a 2" focuser. Overall very diffuse. With UHC filter not visible, with [HBeta] filter seen as large, rather elongated brightening without any details. The shape appeared irregular, the edges itself quite diffuse. Compact, roundish brightening with central star. Nebula barely visible with direct vision. Extremely faint brightening. Almost held with averted vision. Slightly elongated, rather faint brightening. At 48x comet shape hinted, at 66x clearly seen. One side appeared brighter and better defined. NGC2264 describes a larger HII region, which includes the Cone Nebula, the Christmas Tree Cluster and the diffuse nebula described here. The DSS image alongside shows only an extract of this region. SQM-L 18.7, NELM 4.0, Moon (60% illuminated): Fairly well visible with averted vision, elongated, evenly bright. Brighter than expected. Also perceptible with UHC filter, but appeared obviously fainter. Only the brightest part north of 52 Cyg was visible, but faint. Evident with averted vision. The northern part most evident and sharply defined. 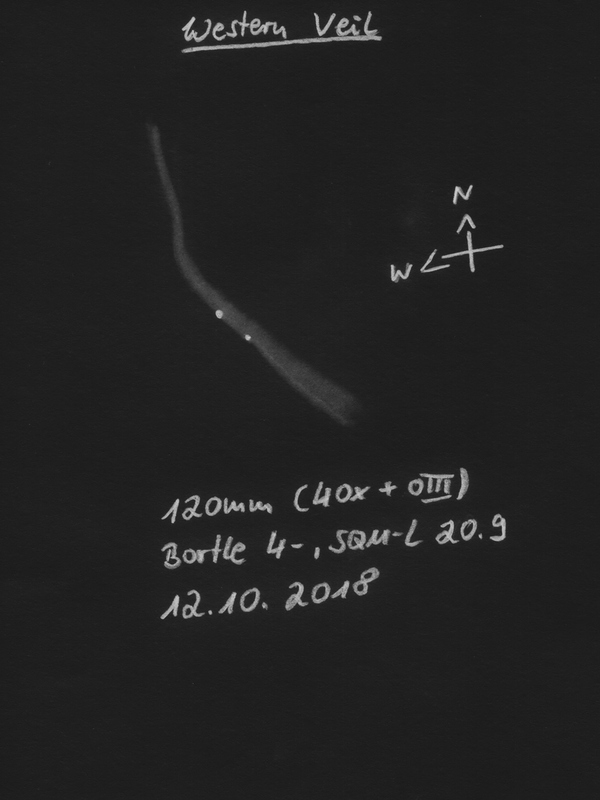 The southern fainter part appeared in comparison very diffuse, but still well visible. Barely visible with direct, evident with averted vision. Northern part most easily seen, pretty thin, slightly curved and sharply defined. The sourthern part is wider and fades into the background. Brightest part of the veil nebula. 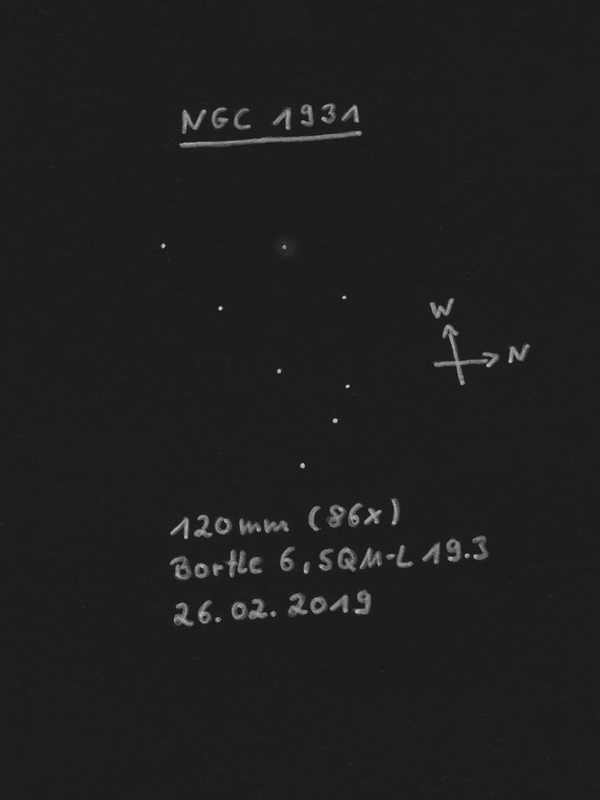 Consists of NGC6992, NGC6995 und IC1340. IC1340 is the fainter, southern part. Awesome view with [OIII] filter. Seen with averted vision as very faint, slightly curved brightening. Difficult to extract from the background. Only a wisp of nebula. Rather faint, curved brightening. Northern und southern part was most apparent. Slightly curved, faint brightening with irregular shape. Typical shape well seen, slightly curved. At the southern end the bifurcations ("fingers") well visible with averted vision. Easy to see and very evident. Northern and southern part most obvious, middle part visible with averted vision. The bifurcations in the southern part are well perceptible. Holding a 2" UHC filter in front of my eye I could see the rough shape of the nebula with averted vision. Very large and more evenly bright. Unexpectedly easily seen with direct vision as large brightening and many foreground stars. Nearly evenly bright. The shape of North America was evident. Pickering's Triangular Wisp is the third-brightest part of the well known Veil Nebula. While the two brighter parts (Eastern & Western Veil) are bright and well defined in their shape, this nebula is much more fainter and diffuse. Just a faint, irregular haze. Anything but evident. Without any filter the nebula is visible only under very clear, dark skies. Hardly perceptible with averted vision. Quite evident with averted vision as irregular brightenings in a field of about 2°. Quite interesting object, which is listed as a galaxy in the UGC/MCG, whereas in Simbad it is a reflection nebula. However to me it appears visually more as a reflection nebula due to the bright, stellar center (central star!? ).